Thrill-seekers and race enthusiasts get ready for Philips Urban Adventure, this will give you a chance to a fun and challenging adventure. You and your partner would have a chance to win win P100,000 in cash and prizes.So look for your partner and get ready for the best adventure and fun challenge of your life. 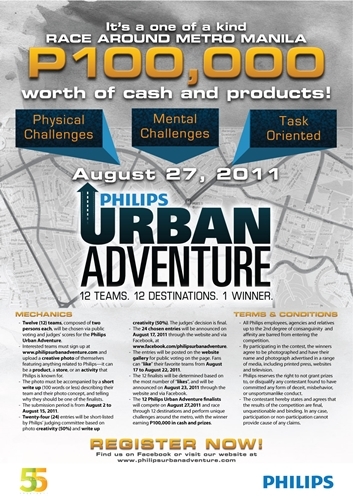 Registration for the race is now ongoing, and interested teams may sign up at the official website, www.philipsurbanadventure.com, where they will be asked to upload a creative photo of themselves featuring anything related to Philips, such as a product, a store, or an activity that Philips is known for. From August 2-15 you could send and sign-up application form, 24 teams will be chosen then it will be cut to 12 best teams according to Facebook votes and comments (August 17-22). It will be easy if you really want to join this physical activity. 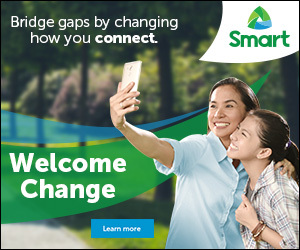 Philips Philippines prepared the great challenges and surprises ahead of you. 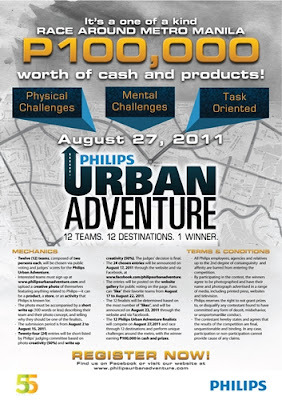 Like Philips Philippines on Facebook and the official Philips Urban Adventure site for the mechanics and information. 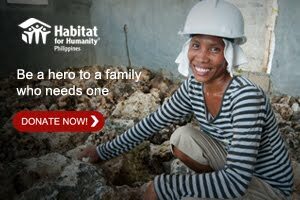 Sign-up NOW ! !